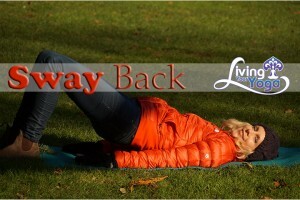 Do you really have Sway Back? :Today’s question comes to us from Namaste Yoga member, Darlene. BTW, Darlene has performed some incredibly generous karma yoga for me by cataloguing all our membership videos, so thank you Darlene! Joining this community and practicing with you has really brought an awareness of my body to my attention. Now I realize that I have a sway back that also results in a protruding belly. Can you recommend some poses to help correct this? So first of all it is normal to have an inward curve in your lumbar spine and low back. So I would definitely make sure you get this checked by a medical professional to see if this is anything out of the ordinary. Excessive lumbar hyperlordosis occurs with an excessive forward tip of your pelvis. Here is the thing about this, for years we as yoga teachers have been telling our yoga students to tuck their tail bones under and this has been flattening out the natural curve in your lumbar spine. Judith Hanson Lasater teaches that your spine is like a river with curves. The structure of your spine is most stable and congruent when you have those curves. We are a sitting culture. We are used to tucking our tailbones under when we sit in chairs and this further flattens out our low backs. Yoga teacher and core walking instructor Jonathan Fitzgerald says that many people lean forward in their thighs and back in their trunk. It doesn’t always pull the pelvis into a tuck, but often it does. Like Lasater, Fitzgerald says we need to have a curve in our lower back, albeit the smallest possible curve. Although our low back curve is essential, it does not need to be large. If your curve is too big or does not exist, the spine is not going to work well. The benefit of standing with a natural curve in your lumbar spine, or a relaxed buttocks is that your legs will be under your pelvis. Jean Pierre Barrall also explains that when your lumbar spine is in its normal curve it supports your organs. If your tailbone is tucked under, your organs will fall down onto your prostate, bladder and uterus. So, when you ask about swayback Darlene, it makes me wonder, is she talking about the natural curve of her lumbar spine? (because this would be desirable) Check in and see. Keep practicing the Intelligent Core class. If indeed you do have excessive lordosis then I would recommend strengthening your core and buttocks. Here are two poses that I would recommend.